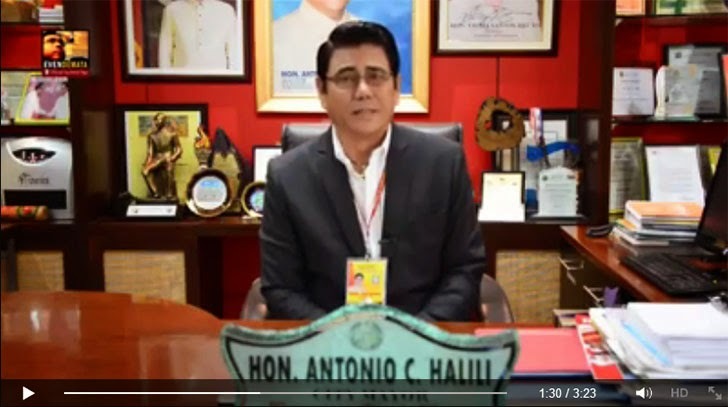 In this viral video, Tanauan City Mayor Antonio Halili asks action star Robin Padilla to make a biopic of Davao City mayor Rody Duterte instead of singer and convicted crime lord Herbert Colanggo. The local chief executive said he heard in the morning news that the lead actor of "Bonifacio: Ang Unang Pangulo," an official entry for the 2014 Metro Manila Film Festival (MMFF), mulls on doing a biography movie of the robbery group leader. Halili explains that Herbert C., also known as Ampang Colangco, is a not a good role model for the youth and making a film that dramatizes his life would create an impression that he should be admired or idealized in spite of his wrongdoings. Colanggo, who was awarded as New Male Recording Artist of the Year at the 6th PMPC Star Awards for Music last September for his songs and music videos that were recorded and shot at the maximum security compound of the National Bilibid Prison in Muntinlupa, is serving a 12-year sentence for a 2009 bank heist. He has allegedly turned into an influential inmate and drug lord while in prison. Halili urged Padilla not to pursue his plan to make a movie of Colanggo's life story. The video, which was posted December 22 on Facebook already garnered more than 1,400 shares and over 47,000 views as of this posting.